NIKISHINE, Ukraine -- Russian President Vladimir Putin told Kiev to let its soldiers surrender to pro-Russian rebels, who spurned a ceasefire in eastern Ukraine and fought their way on Tuesday into the town of Debaltseve, encircling thousands of government troops. 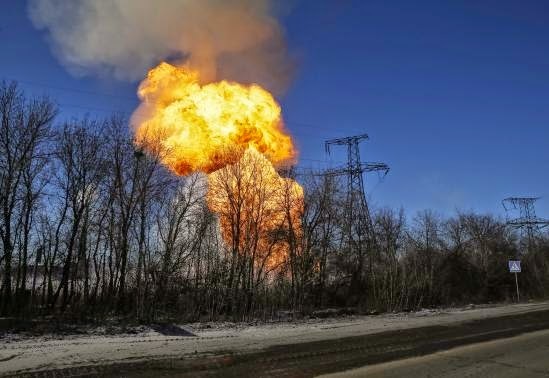 A view of an explosion after shelling is seen not far from Debaltseve February 17, 2015. A peace deal reached at all-night talks in the Belarussian capital Minsk last week had all but unravelled, with both sides failing to begin pulling back heavy guns as required after the rebels refused to halt their advance. Putin, whom Western countries accuse of directing the rebel assault with Russian soldiers and weapons, said Kiev should allow its soldiers to surrender to the advancing rebels. "I hope that the responsible figures in the Ukrainian leadership will not hinder soldiers in the Ukrainian army from putting down their weapons," Putin said. He added that he hoped the rebels would allow the Ukrainians to return to their families, once they had surrendered the town. Journalists near the snowbound frontline said artillery rounds were rocking Debaltseve every five seconds and black smoke was rising skywards as Grad rockets pounded the town. The rebels say the ceasefire announced last week does not apply at all to the main battle front at Debaltseve, a railway hub in a pocket between the two main rebel-held areas. "Eighty percent of Debaltseve is already ours," said Eduard Basurin, a rebel leader. "A clean-up of the town is under way." He later said negotiations were under way for 5,000 Ukrainian troops to surrender. "Hundreds" had been captured and would eventually be released to their families. Ukraine denied that the number of captives was that high. Despite Putin's public call for a surrender, Russia sponsored a resolution adopted by the U.N. Security Council that called on all sides to implement the truce agreement, expressing "grave concern" at the violence. Putin was visiting Hungary on Tuesday, his first bilateral trip to an EU country since last July, when Moscow was left isolated after a Malaysian airliner was shot down over rebel-held territory with what Western countries say was a Russian-supplied missile. Hopes that the deal reached last Thursday would end a conflict that has killed more than 5,600 people were always low after a rebel advance in January ended an earlier truce. But Western countries appeared surprised that the rebels had refused even to pay lip service to the ceasefire at Debaltseve. Russia has already annexed Ukraine's Crimean Peninsula, and Western countries believe Putin's goal is to establish a "frozen conflict" in eastern Ukraine, gaining permanent leverage over a country of 45 million people seeking integration with Europe. Ukrainian President Petro Poroshenko called the rebel assault on the town a cynical attack on the Minsk agreement. Kiev's military denied that the town, which had a peacetime population of 25,000 but is now a bombed-out wasteland, had fallen, but acknowledged losing some of it. Kiev and NATO say the rebel assault on Debaltseve is being reinforced by Russian tanks, artillery and soldiers. Moscow denies that it has sent its forces to participate in the battle for a region that Putin has dubbed "New Russia". Washington said it was "gravely concerned" by the fighting and was monitoring reports of a new column of Russian military equipment heading to the area. The United States has been considering sending weapons to aid Kiev, although the State Department said on Tuesday getting into a proxy war with Russia was not in the interests of Ukraine or the world. Putin said he believed foreign weapons were already being supplied to Kiev. "As long as there is a signed deal to which the parties still refer as something that needs to be implemented, I will not say that there is a failure." The fighting meant both sides had spurned Tuesday's deadline to being withdrawing heavy guns from the frontline. Kiev says it cannot pull back as long as the rebels continue their advance. Military trucks and tanks came and went in the largely destroyed village of Nikishine as the rebels pounded nearby Debaltseve with rockets, heavy artillery and mortar bombs. "We'll take Debaltseve. It will all be ours. Our homeland will remain our homeland," said a rebel tank operator who gave his name only as Bass, his nom de guerre. Observers from the OSCE security group, delegated to monitor the ceasefire under last week's agreement, have been kept out of Debaltseve by the rebels. "We do not have the right (to stop fighting for Debaltseve). It's even a moral thing. It's internal territory," said Denis Pushilin, a senior separatist figure. The goal would be "destroying the enemy's fighting positions".